Projects provide “hands-on” opportunities for a grateful nation to step up and show our military you love them. For information about our “hands-on” opportunities, please join our Yahoo Group where all of our projects are administered across the country…and beyond. This is the best way for us to keep everyone on the same page. Things change quickly during this time of war – the Yahoo Group allows us to keep everyone informed of changes as we learn of them. We hope to see you there real soon! Support provided is based on the identified needs of our medical units and the Wounded Warriors entrusted to their care. We do not share addresses of the military units we’re providing for. Our work is a collaborative effort and you’re invited to share your time, talent and resources to ensure those needs are met. OQC has been hard at work every week…every month…every year since July 20, 2004! 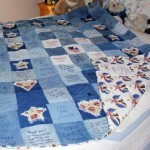 made by those who are injured while serving in harm’s way. 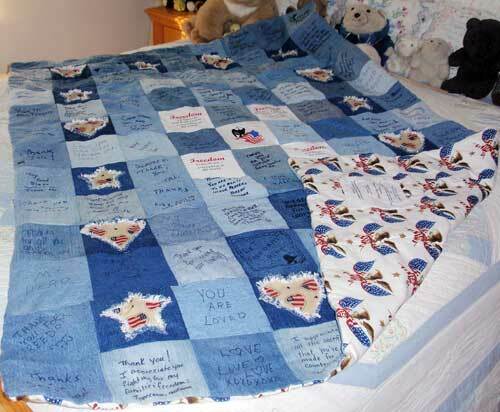 OQC provides small quilts (3’ x 5’ finished) to comfort our Wounded Warriors who are medically evacuated to a higher level of care, as well as for those troops who are sick or injured and recovering in place. We have specific project requirements and ask that you follow them closely. Join the Operation: Quiet Comfort Yahoo Group to find more information on how you can contribute a project.